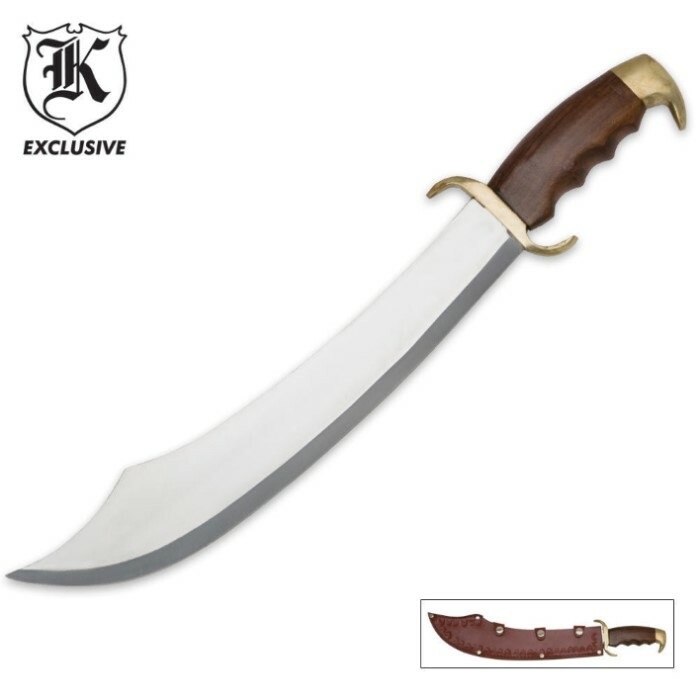 Arabian Sands Saber Sword & Sheath | BUDK.com - Knives & Swords At The Lowest Prices! 2 or more only $15.00 each! This Arabian Sands Saber Sword is unlike any sword in your collection because it really gives you the look and feel of the majesty of The Arabian Knights. The extra wide stainless steel blade is 13" in length and is heat tempered. The handle is solid wood with heavy brass accents that make it a very hefty sword. A genuine leather sheath completes the package. A strong blade with a beautiful finish. The half tang causes an issue but it is easily fixed. Overall a good piece that demands respect. THIS FITS THE OTHER SPECTRUM OF MY KNIFE COLLECTION. SOMETHING DIFFERENT. I WAS HESSITANT TO ORDER IT AT FIRST. NOW , I'M GLAD I DID. THE BLADE ITSELF, IS HEFTY. THE HANDLE FITS PERFECT IN MY HAND. ( AND I HAVE BIG HANDS ) SHARP AND POLISHED WELL. THE SHEATH LEFT SOME CLASS OUT,BUT THAT'S NO BIG DEAL. I KNOW A GOOD LEATHER MAN. ALL IN ALL, FOR SIXTEEN BUCKS, A GOOD INVESTMENT FOR THIS BLADE. SIR: MY REPORT ON THE ABOVE-NAMED WEAPON IS AS FOLLOWS; THIS PIECE COULD NEVER BE OF USE TO US IN OUR SQUAD OPERATIONS. IT IS A LITTLE TOO SHORT FOR A RIGHTEOUS BATTLE SWORD; A LITTLE TOO LARGE AND UNWIELDY FOR A GOOD COMBAT KNIFE; PLUS IT IS NOT ROBUSTLY BUILT. IT IS, HOWEVER, IN FORM A HISTORICALLY ACCURATE DEPICTION OF AN EARLIER ARAB TRIBAL WEAPON. FOR OUR USE, IT WOULD MAKE A SUPERB CONVERSATION-PIECE AND A GREAT WALL-HANGER FOR THE SQUAD ROOM. THAT IS MY REPORT! DAN BELEW, SGT. FIRING SQUAD COMMANDER. i love this sabre.its huge and have a great look and balance. Good weapon, light but the wood handle is slippery. Short sword also, but good buy. Nice knife, too small to be considered an sabre at all, just within the large bowie/small machete range. However the handle ruined the whole thing for me. To my frustration, I was unable to get all four fingers onto the handle, making this thing useless to larger men. Pros: sharper than I expected and heavier than I expected (made of decent quality metal); I doubt you'll get anything better for this price. The Arabian Sabre is one of the most practical, yet aesthetic works of military art available. I think of it as a Mini-Scimi, or a Bowie on steroids. 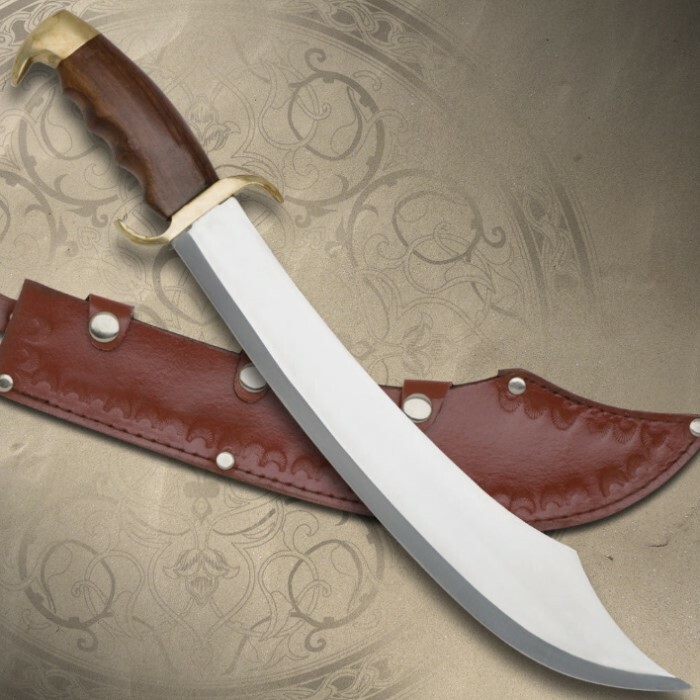 At nearly 18", it's the size of a close-combat sabre, or a massive Bowie swung with bad intent. I had to sharpen mine a bit, as the edge didn't seem as scary sharp as some of my other blades. That, plus a session with the Magic Cloth, brought out a really keen edge AND a brilliant, lustrous shine. It's now one of the most useful and attractive of all my display knives. GREAT bargain, too, at just $13. Again, good job, BUD.